It’s easy to get lost on the quest for perfection… you want things to look beautiful… cohesive… professional. (This is why I’m always harping about branding with small business owners.) 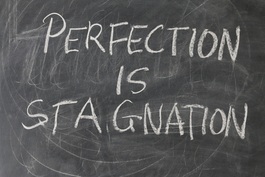 But what happens when perfection becomes a stalling technique? I know the struggle, trust me. When I worked in the corporate world, my boss would stop me and say, “Seryna… sometimes good is good enough.” and that’s always stuck with me. :: Are you sweating the small stuff? :: Are you putting all of your energy into elements of your business (copywriting, website tweaks, social media, etc) that are taking you away from building your actual business? Yes – having professional marketing – virtual or otherwise – is important. But when you’re first starting, having just the basics is totally okay. Keep your investments (financial and time) small, and get out there building your empire. So how do you do this? – Make a Facebook page to post your contact details and some content (keep it valuable to your reader). – Create a 1-page landing page with a compelling offer to build your list but make sure there’s a way to reach you on it. – Business cards are one of the least expensive ways to promote yourself. If you don’t have your website done yet, or you haven’t set your brand guidelines, do a small run of a basic card that has your contact details. You want them to be able to reach you – you can make it pretty later. Check out Vista Print – they are inexpensive and regularly have promotions. – Commuting is time consuming. When possible, pick up the phone, or use tools like Skype or Google Hangouts to have virtual meetings when being in person isn’t a necessity. – When possible, if you’re doing in person meetings, try to stack them so you see clients in the same area around the same time. This cuts down on driving time and makes your days more time efficient. There’s a beautiful quote by Marie Forleo… she says “We’re aiming for progress, not perfection.” Just keep putting one foot in front of the other, and the rest will fall into place.